Status update for GeoGebra. | Conecto ergo sum. My contributions for the first part of the first part of GSoC 2010 can be divided in two: general improvements and coding. Refactored build.dir in ant build file. Previously, build.dir wasn’t in the root directory. A few ant tasks were added, such compile-grammar, compile-oe (outside Eclipse), run-easyb and run-easyb-outside-eclipse. SVN properties were set in order to work outside Eclipse. This way, .class files will be kept out of the repo without the intervention of any Eclipse plugin. Easyb, a BDD groovy-based framework, has been included in order to test GeoGebra. It is not RSpec, but I guess it’ll do. EquationFreePoint represents an independent point. EquationSymbolicPoint represents a dependent point, EquationSpecialSymbolicPoint standing only for the locus point. 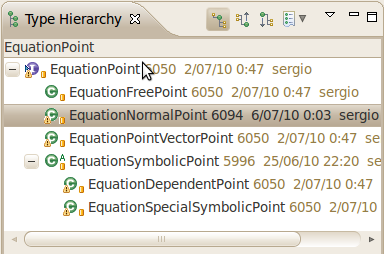 EquationNormalPoint and EquationPointVectorPoint are only auxiliar elements. forPoint: Given an EquationPoint, returns a String with the equation that means that the point is in the construction. isAlgebraic: returns true if the construction is algebraic, and false otherwise. Both EquationGenericCircle and EquationGenericLine are abstractions of specific line and circle contructions, all of them algebraic. 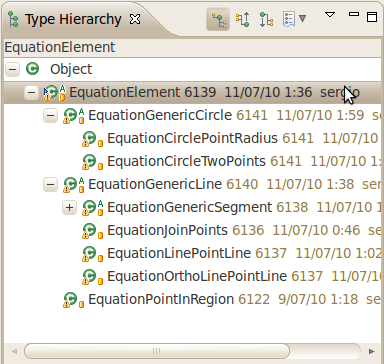 EquationGenericSegment is to segment what EquationGenericLine is to lines. Obviously, EquationGenericSegment is not algebraic. All of these classes are used together by EquationScope. A pause for a screenshot. Maybe Equation should be a proper class, not just a String. Working out the locus equation. Not using an algorithm twice.